The path that the water takes through a turbine and the general layout is often used for classification, like tangential-flow, radial-flow cross-flow and axial-flow. Below are the various categories of ‘water driven prime mover that can be used to convert the ‘potential energy’ in a river or stream into usable ‘mechanical’ or ‘electrical’ energy. This section continues with information on what types of turbine are suitable in various sites and applications. Gravity devices are those where any kinetic energy present at the entry of the device is either minimal or lost in turbulence and does nor contribute measurably to the output of the device. Such devices include most waterwheel types, Archimedes screws (where the outer case rotates with the flutes); Hydrodynamic screws (as used for sewage pumping and now being used in reverse as low-head prime-movers); Norias (more commonly used for raising water) and consist of a string of buckets like an overshot waterwheel attached to form a chain, and positive displacement devices or hydraulic engines. Impulse turbines are those where the potential energy in a ‘head of water’ is largely converted into kinetic energy at a nozzle or spout. The simplest of such devices is the Gharat or Norse Wheel (where the conversion to kinetic energy takes place in an open flume). The more conventional devices harness the potential energy in a pipeline or penstock that terminates in a nozzle. The flow path through the turbine is usually used to describe the specific device, namely, tangential-flow, radial-flow, cross-flow, axial-flow or mixed-flow. Specific turbine designers have been associated with most of these devices, though confusion can result because they often designed several different types of device (The Pelton Waterwheel Company also made cased reaction turbines, Herschel pre dates Jonval’s patent that was the precursor of the Turgo Impulse wheel, a single nozzle version developed by Gilkes. Donat Banki, a Hungarian was also making cross-flow turbines many years before Mitchell and Ossburger came on the scene. Reaction turbines are those where the turbine runner is usually completely flooded and the transfer of energy from the water to the turbine runner is achieved by a combination of reaction and/or lift. Some designs of cross-flow turbine in common use a combination of impulse and reaction. Reaction turbines have had a more complex development, with many designers and factories adding features such as movable ‘wicket gates’ that resulted in Francis’s name becoming the tag by which this group of turbines are now known. The Kaplan turbine developed in the 1930s is a sophisticated variable geometry version of the ‘propeller turbine’ that as its name suggests is similar to a ship’s propeller in a housing. Halfway between these types is the single regulated propeller turbine, where either the runner blades or the ‘guide vanes’ (wicket gates) are adjustable. Free-stream devices encompass large slow running wheels and turbines, some of which are being tried out for marine energy applications. Like wind turbines, the power delivered increases as a cube of the velocity, such that a doubling of the velocity gives an eight fold increase in power output. The devices themselves are very large and slow running and only have very specialised applications for extracting small amounts of power from bank-side locations on very large rivers. High head sites with over 20 metres of fall, where the water is conveyed directly to the turbine in a pipe (penstock) or via an open canal followed by a piped section, generally use impulse turbines. The reason is that high head sites are usually subject to significant changes in water flow and reaction turbines like the Francis are not able to cope with such variations. Silt in the water can also cause a lot of damage to Francis turbines that is expensive to repair. One of the most successful high head turbines was developed in California during the gold rush from a device referred to as a ‘hurdy gurdy’ that was basically a cartwheel with buckets around the periphery. A carpenter by the name of Lester Pelton came up with the now familiar double bucket shape and went on to found ‘The Pelton Watewheel Company’ of San Francisco. The bucket design was later improved by Doble who joined the company as an engineer in 1899. Doble’s improvement is the central cut-out in the bucket that prevents the water jet from first striking the back of the bucket and wasting energy. www.oldpelton.net. Today, similar machines are operating from over 1000 metres of fall and generating up to 100MW of power. A simple weir is all that is required to divert the stream into the penstock (pipeline) via a de-silting chamber to remove any sand. Water storage may be included if the terrain allows and if it is advantageous to generate more power for short periods or where it is necessary to store water for generation when flows are very low. A low-pressure pipe or open canal may also be used to reduce to overall cost if it allows a short steep decent to the powerhouse using less high-pressure pipe. Pelton turbines are efficient over a very wide range of flows but at lower heads the speed is too low for belt drives, so we reduce the pitch circle and modify the bucket shape to increase the specific speed. The jets may have plain nozzles or adjustable spear valves to adjust the water consumption to the available stream flow. It is usual with larger machines to have ‘deflectors’ that divert the water away from the runner for controlling the speed without altering the water flow. They can also be used for emergency shutdown. Turgo Impulse turbines, the name given by Gilkes of Kendal, is a ‘jet supplied impulse turbine’ that has its origins back in the early 19c when Herschel and Jonval and latterly Gunthers of Oldham made similar turbines. The ‘Turgo’ with one or more jets is often used for lower heads where it is necessary to keep the shaft speed up for direct driving the generator. A two jet ‘Turgo’ runs at about twice the RPM of an equivalent four jet pelton, and the runner is significantly smaller but the efficiency is a little lower. Our own Armstrong turbine has been developed from the same origins as the ‘Turgo’ but works with almost 100% admission so the power output is much higher for a given runner diameter. Unlike cross-flow turbines the stress levels are much lower and the runner is completely cast in stainless steel. 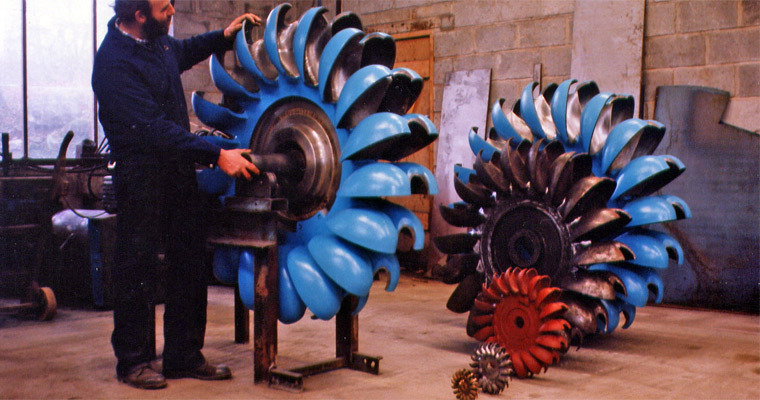 Francis turbines are widely used for larger hydroelectric projects where high efficiency and small size are important. The part flow performance and relatively high cost means that they are less common on small schemes less than about 100 kW. We rebuild this type of turbine as and when the need arises. Pumps running as turbines can sometimes be an economic solution, but from the prices I have seen, customers are paying as much for a pump as for a simple turbine. The tendency is to compare the price of a standard pump with a full-blown variable flow turbine, and here the pump will be cheaper. If you compare the price with a basic turbine, there will be little or no difference and you have the significant advantages that not only will the turbine be more efficient, there may well be the capability with an impulse turbine in particular, to adjust the flow be machining the nozzle to match the site, as opposed to a continuously variable machine. For thousands of years waterpower has been harnessed for milling and pumping water. In the Developing World many are still in daily use, but in Western Countries they have usually fallen into disrepair as a result of competition from diesel and electric power. In the U.K. there were over 70,000 working mills at the end of the 18th century and now there are a few hundred. These mills fall into a number of categories that will determine their suitability for redevelopment. The waterwheels that were used on these sites in the U.K. are usually of the Roman or horizontal shaft type, though the vertical shaft type is much more common in Mediterranean and Asian countries. Depending on the fall of water available, the horizontal wheels are classified into ‘Overshot’, ‘Breast-shot’, ‘Back-shot’ and ‘Under-shot’. With the exception of projects to restore a mill to its original design, or where the visual appearance is important to maintain, only the overshot wheel is suitable for a new power generation projects. Overshot waterwheels are the most fish-friendly and able to handle leaves and sticks. A similar device is the Noria or chain wheel, which has the disadvantage of potential more maintenance, but it runs faster, is more efficient and easier to install than an overshot waterwheel. The power available is a function of the head and flow so building a large wheel will only increase the cost and reduce the shaft speed but not increase the power. Major components in the cost are the primary gearbox and the material required in the construction of the wheel itself. We are happy to build any type of waterwheel, but the cost is likely to be significantly greater than that of an equivalent turbine, when you take the gearing and installation costs into consideration. There are no short cuts with waterwheels and the engineering has to be good, on account of the high torque in the low speed drive. Mills with ponds are seldom suitable for redevelopment for anything other than a few kilowatts because the water flow is obviously too little to sustain the mill on a continuous basis, and it is much too expensive to install a wheel or turbine that can only be operated for a few hours a day. In some cases the ponds were only used in the summer months when the water was low, but today we are looking to the higher winter flow for the bulk of the power that can be used for heating. There is always a loss of head into and out of the pond, but this may be recoverable with a turbine installation. Mills with leats, lades or channels take their water from a water course along the side of a valley at a gradient that is usually less than one in five hundred. At a suitable point when enough fall can be achieved in one place, the mill is built. The only limitations to future development are the actual head and flow available. Since there was a mill there anyway there should be enough power for domestic purposes. Improvements to the leat and head are usually possible but are very site specific. Modern mini excavators make leat widening and maintenance much easier than when the mills were first built. Mills on weirs or with short wide diversion channels present the most difficult challenge for the developer. The available head may only be a metre or so and the flow required to generate useful amounts of power will be several cubic metres of water per second. The undershot waterwheels that were originally used at these sites are totally redundant on account of their high cost and low efficiency. The exact layout of the site becomes increasingly important with the lower falls, because access for excavators and to install the large items of equipment is more difficult. Tubular turbines of the propeller type can be used for mill sites with a higher head, typically those that originally employed ‘Overshot’ waterwheels. Many different arrangements are possible to suite existing civil works but the main compromise arises from their inflexible performance. If the mill is only extracting a small percentage of the available water from the main river, then there is no problem. If however the water flow reduces below that which is required to supply the turbine, either water storage, another smaller turbine or a change in turbine speed will be required. Impulse turbines, like the ‘cross-flow’ are better suited to medium heads because the physical size and cost are out of all proportion, and the efficiency is severely limited by the loss across the runner itself. Large open-flume ‘Armstrong’ designs have lower losses and are smaller on account of the high percentage admission. No casing is required and in common with reaction turbines a draft tube may be employed to gain extra head or set the turbine above flood level. Fish-friendly turbines are similar in concept to early designs of low-head reaction turbine in that all the energy is extracted in the runner that rotates slowly, unlike a high specific speed turbine such as a ‘Kaplan’. The number and spacing of guiding surfaces is reduces and the number of runner blades is reduced. This reduces the ability of the turbine to work efficiently a part flow, but combined with very smooth internal surfaces the safe passage of fish can be assured. Such turbines would normally be installed in multiples on very low head weirs. Archimedes Screws have come into the news in recent years because of their reported fish friendliness, but firstly the units being described are NOT Archimedes screws but Screw pumps running in reverse (hydrodynamic screws) and secondly the hydrodynamic screws are not as friendly as they might first appear. The difference in respect to fish friendliness is potentially significant since the true Archimedes screw has its outer casing rotating with the screw flights so that no fish, eel or lampray can be killed or injured by getting caught in the gap or abraded against the concave that will undoubtedly become rough with time and damage. Low cost open impulse turbines have been developed by us, primarily for projects in the Developing World. Installed outside the mill house like a waterwheel, it is an economic alternative for smaller domestic sites here in the U.K. They cannot be used with a draft tube since the runner is open to the atmosphere but the installation and maintenance is much simpler. The valve control shaft is extended through the mill house wall to an operating lever on the ,inside or a simple open shoot conveys the water directly to the runner in the manner of the old ‘flutter wheels’ used in the USA in the 19c. Installation work is usually kept to a minimum and may be in an old waterwheel pit or even behind an existing wheel under the launder. A vertical shaft version like the Indian Gharat can produce considerably more power by increasing the entry area, whilst maintaining its self-cleaning characteristics. Portable turbines are highly adaptable and be assembled on site in a few hours. Applications include ‘Rural Development’, camping and field hospitals. Typical outputs range from 200 watts to 50 kW. The inlet works are prefabricated and the pipeline is either flexible polyethylene or ‘lay-flat’ coiled pipe. The whole unit can be built into a trailer or air-portable unit for rapid deployment in the field. The buckets that are divided along their centre line by a splitter ridge, turn the jet of water that is directed at them, through 1800 so that the energy is transferred efficiently to the shaft. Turbines that are suitable for a particular type of site and turbines that are suitable for particular type of application are referred to as ‘groups’. Hence you can have a group of ‘Hillstream’ turbines for upland sites, or a group of ‘Agricultural’ turbines for agricultural applications. The site may be defined topographically as an upland or ‘Hillstream’ site, or as a lowland or ‘Millstream’ site. Each of these groups I then divided into two sub-groups depending on the actual site layout and general features. The ‘Hillstream’ group is comprised of vertical and horizontal shaft impulse turbines that may be either direct drive, belt drive or overhung from the generator. The application for the plant may be to generate electricity, mechanically power machinery or pump water for irrigation or for a drinking water supply. The application will also have a bearing on the materials, the sophistication, the governing system and the general build. The power output is used as a general indication of the scale of the project. When the output is better defined, it can be added to the end of the range name as a nominal output, for example ‘Micro 10’ for a microhydro plant with a 10kW nominal output. The size of plant I categorise as ‘Mini’ above 50kW, ‘Micro’ between 5kW and 50 kW, ‘Pico’ between 500 watts and 5000 watts and ‘Nano’ below 500 watts. This refers to a family of similar turbines of different physical sizes, each one having a ‘Type Number’ including a ‘Build Reference’ to say what it was made of and any specific modifications. An example would be a series of vertical shaft Pelton turbines from 100mm PCD to 800mm PCD all having the same general layout. The first letter gives the orientation of the shaft (vertical, angled or horizontal) the second letter gives the type of enclosure (flat sided, circular or open flume) and the next group of two or three letters designates the type of turbine runner, followed by the size details. In the case of a Pelton turbine (PE) this is followed by the maximum jet size, the number of buckets and the ‘pitch circle diameter’ (PCD). Each turbine design will have its own designations. Following the ‘type number’ are letters or notes to indicate materials or build standard such as agricultural, standard or premium. For details on individual turbines look under ENGINEERING for descriptions or PRODUCTS for information sheets giving details such as dimensions and weights.